DVD Series 500 & Bk Rise! Jesus is Risen from the dead! Through him we will one day rise from our graves to everlasting life. But because of his resurrection we can experience a new impulse of life Now! There is new energy to be enthusiastic about life. You can experience a greater depth with God in your prayer life. You can face your challenges and because of them find new life. You can face any bad habit, sin or addiction and discover the power to overcome. The resurrection isn’t just for the hereafter, but for the here and now. Purchase this book and DVD series and experience resurrection today! Value CD 500 & Rise! CD Series 500 & Bk Rise! Jesus is Risen from the dead! Through him we will one day rise from our graves to everlasting life. But because of his resurrection we can experience a new impulse of life Now! There is new energy to be enthusiastic about life. You can experience a greater depth with God in your prayer life. You can face your challenges and because of them find new life. You can face any bad habit, sin or addiction and discover the power to overcome. The resurrection isn’t just for the hereafter, but for the here and now. Purchase this book and CD series and experience resurrection today! Prayer is our lifeblood as Christians. It is through prayer that we develop our personal relationship with God. We are comforted, strengthened and guided through life. Lent is a word that means Springtime. This important season in the Church year is a time of change, growth and spiritual depth. This series is based on “Year C” in the liturgical calendar. Experience new life and revolution as you watch these episodes. Prayer is our lifeblood as Christians. It is through prayer that we develop our personal relationship with God. We are comforted, strengthened and guided through life. Lent is a word that means Springtime. This important season in the Church year is a time of change, growth and spiritual depth. This series is based on “Year C” in the liturgical calendar. Experience new life and revolution as you listen to these episodes. Prayer is our lifeblood as Christians. It is through prayer that we develop our personal relationship with God. We are comforted, strengthened and guided through life. Many people struggle with their prayer life. Fr. Cedric will share about how to be heard by God as well as how to hear God in your daily life. Be inspired and learn how to abide in Jesus Christ and bear abundant fruit. Prayer is our lifeblood as Christians. It is through prayer that we develop our personal relationship with God. We are comforted, strengthened and guided through life. In prayer we abide in Jesus and bear much fruit. Prayer is also the channel through which a person comes to sobriety. It is through conscious contact with God that a person can admit they have a problem, come into recovery and stay sober. There is power in prayer and in the 12 Step program! 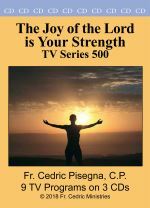 This book and series will help all people to connect with God and for those with addictions to gain sobriety. There is a solution! Value DVD 600 & Rise! DVD Series 600 & Bk Rise! God said Caleb had a “different Spirit.” Following Jesus is a break from the norm. As you live with passion and work at your potential, you will influence and impact others. You have been “called out” of darkness to proclaim God’s marvelous works. Because God is with you, victory is in your future! The book Rise! teaches that we already participate in Jesus' resurrection. His resurrection can revolutionize your life now. CD Series 600 & Bk Rise! Many people struggle with their prayer life. Fr. Cedric will share about how to be heard by God as well as how to hear God in your daily life. Be inspired and learn how to abide in Jesus Christ and bear abundant fruit. Windows are openings that lead us to new opportunities. Wisdom is understanding that comes from life experience as well as revelation given directly from God. God’s grace is his initiative, his favor, in our life. His grace empowers us to face challenges and to overcome the difficulties of life. Because of grace we can dream dreams and accomplish them. Grace comes suddenly and abundantly. Expect a rush of grace in your life. The book on the Holy Spirit will help you receive the source and giver of all grace, the Holy Spirit. These two DVD series will help you to receive and experience God’s love and because of Christ’s love, we can not only face the multitude of challenges that come our way in life but they can even catapult us to greater heights. As you watch, you will learn how to hear the voice of God, be positive, know God’s goodness even where there are trials and sufferings, live life with a “can do” attitude and allow your problems to promote you. Because of God’s love, we are more than conquerors through Christ. These two audio series will help you to receive and experience God’s love and because of Christ’s love, we can not only face the multitude of challenges that come our way in life but they can even catapult us to greater heights. As you listen, you will learn how to hear the voice of God, be positive, know God’s goodness even where there are trials and sufferings, live life with a “can do” attitude and allow your problems to promote you. Because of God’s love, we are more than conquerors through Christ. This book and four talks in the CD package will help you know the Holy Spirit in a deep, personal way and learn all about the new birth. Unlock your potential as you become grounded and rooted in God's love within you. Who you are is God's gift to you. Who you become is your gift to God! Live Passionately! + CD Set #2 Live Passionately! This 200+ page book and seven talk CD set will help you renew your relationship with God as well as gain new perspectives on life. Experience the purpose of the passion. Grasp the salvation Jesus died for you to have. Surrender to Jesus and know his new life within you. 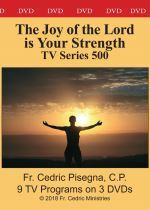 Understand suffering and the meaning and goal of your life: transformation through the cross. This combo pack of my 200+ book and four teachings on CD will inspire and help motivate you to change. With God's help, U-Turns are permitted. Don't remain stalled or go backward. By the grace of God, go forward! As you surrender to God's grace, you will discover that you can change more than you ever dreamed!